Words that are pronounced the same often confuse the learners of English. These words are homophones. Homophones sound the same but have different meanings, origins or spellings. 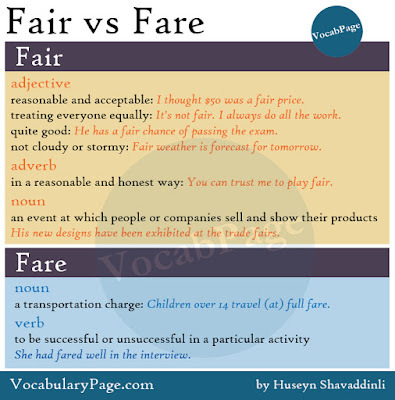 Fair and fare are two commonly confused words in English because they are homophones. Fair and fare are both pronounced as /feə(r)/. The word fair can be an adjective, adverb, or a noun and has a lot of meanings. As an adjective it means (1) reasonable and acceptable, (2) treating a group of people equally, (3) quite good, (4) not cloudy or stormy, (5) pale, and (6) blonde. I thought $50 was a fair price. He has a fair chance of passing the exam. Fair weather is forecast for tomorrow. The adverb fair means in a reasonable and honest way or according to the rules. You can trust me to play fair. Fair can also be used as a noun to mean an event at which people or companies sell and show their products. His new designs have been exhibited at the trade fairs. Fare can be used as a noun or a verb. Children over 14 travel (at) full fare. The taxi driver picked up two fares outside the airport. She had fared well in the interview.